Hey Charlotte Where’s My Shaving Foam ? 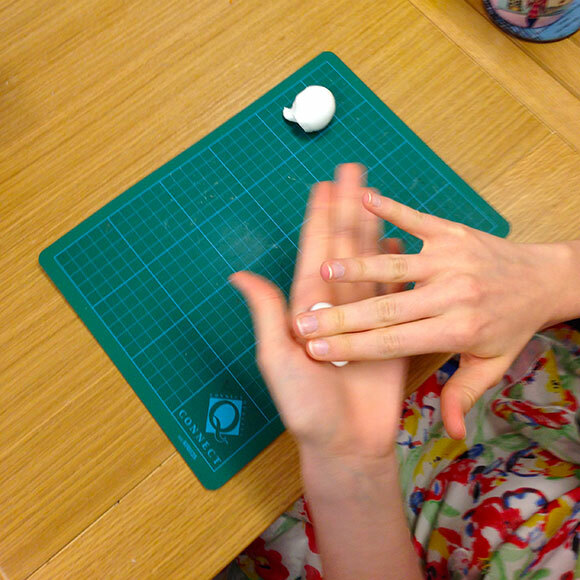 To start, I sprayed an even layer of (bargain priced) shaving foam onto a plastic tray. After adding the shaving foam to the messy tray I sprayed the dye on to the surface of one side. I then added a second colour to the surface. Then to add a little texture to the surface I used a wooden stick to create straight lines up and down the shaving foam mixing the colour on the surface of the foam. 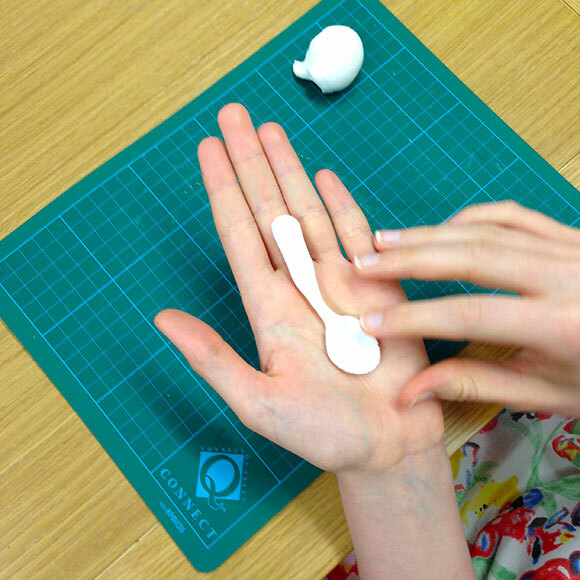 Then take the piece of card or paper that you want to transfer the pattern to and place it gently on the surface of the shaving foam. 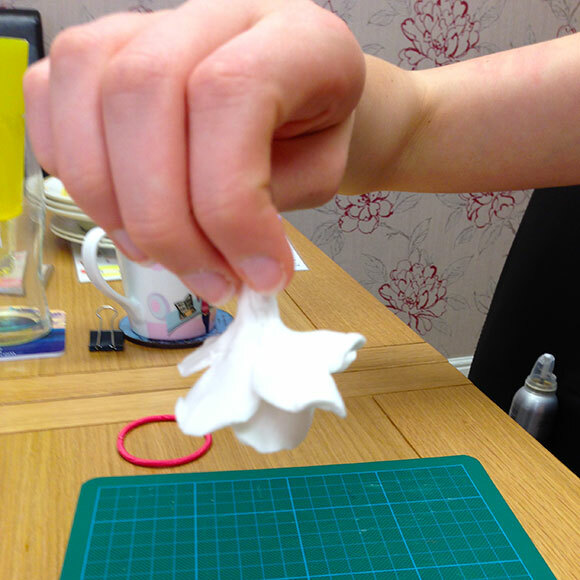 Once the paper is resting on the surface of the shaving foam press it gently to get an even coating of colour. 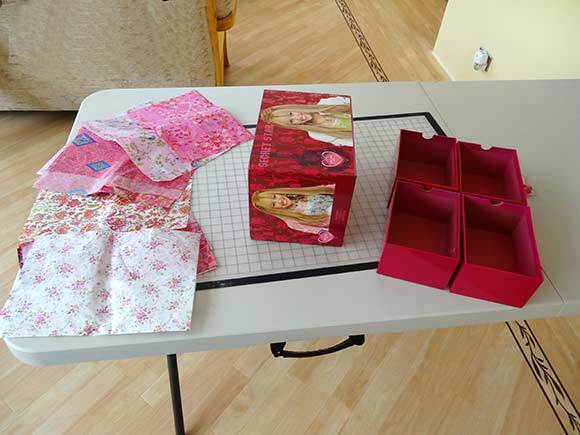 Peel back the paper or card gently and evenly lift it out of the tray. 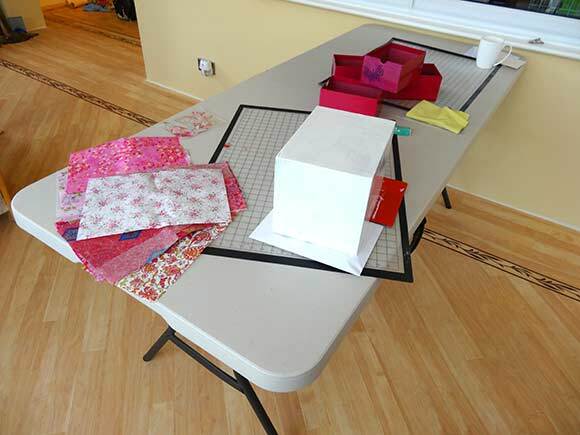 Place the paper or card flat on your work surface. 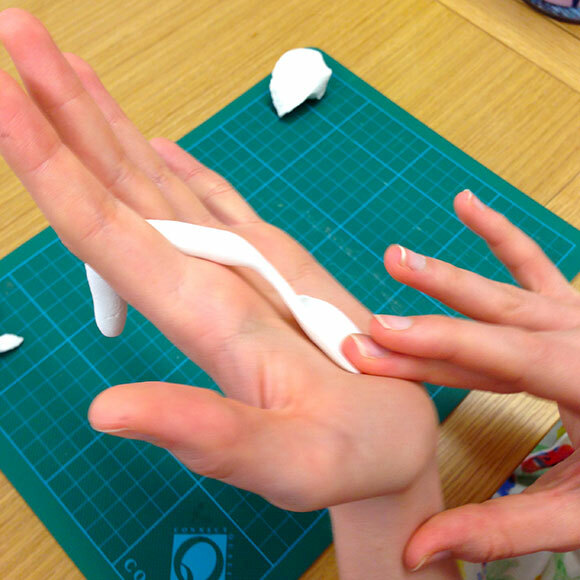 Then gently scrape off any shaving foam that has stuck to surface with a ruler or other straight edge. 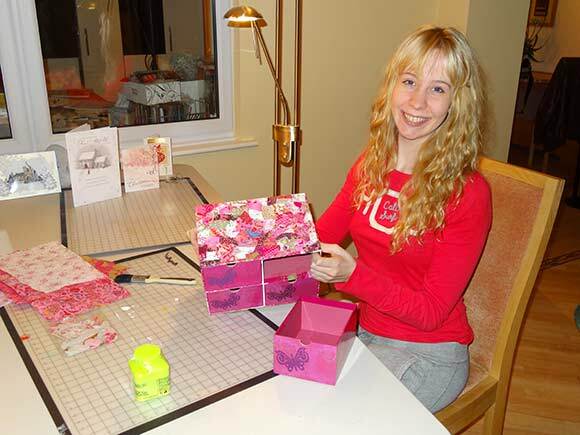 The ink dries quickly to the paper or card and you can wipe away any foam that might be left. 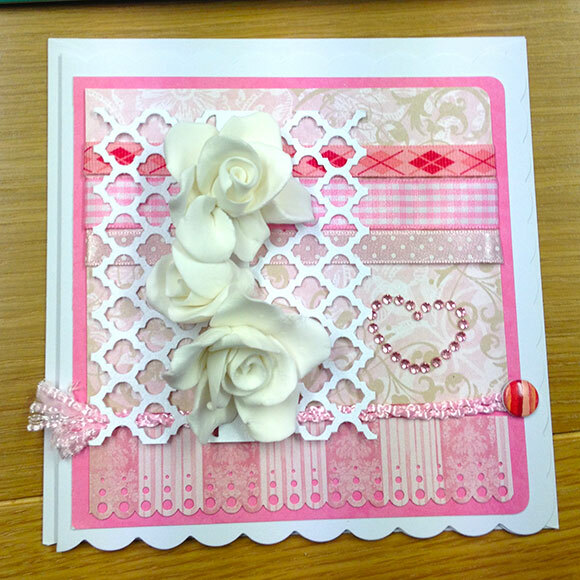 The swirls and patterns can make lovely backgrounds for cards or other craft projects. It is really quick to do and the only other thing that I would recommend to you is using latex gloves to keep the dye off your fingers. 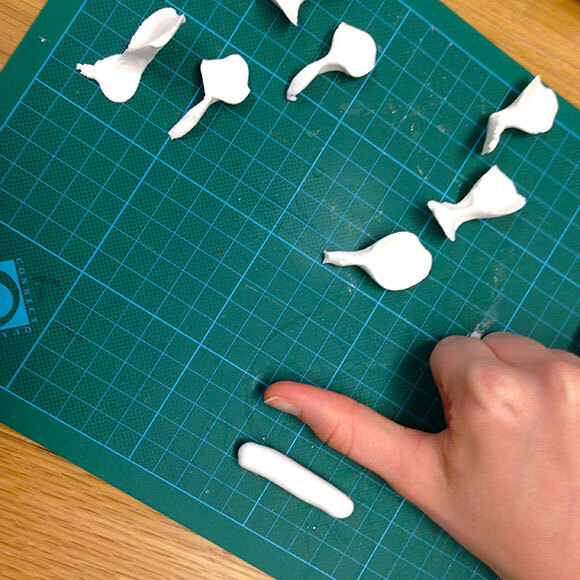 You can use the shaving foam in your messy tray more than once just add a little extra dye. One the things I enjoy when I’m back home with my parents is adding to my crafting skills. 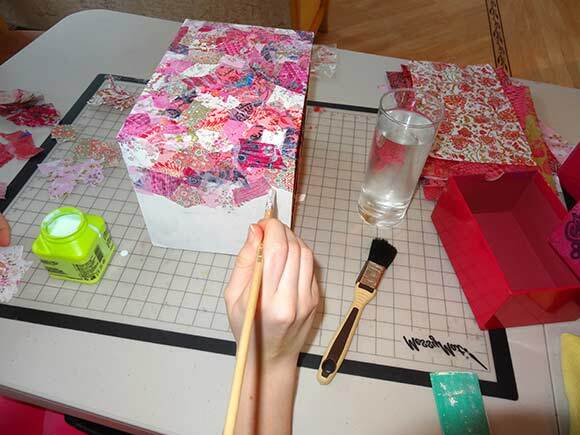 I find that dabbling in craft and art projects is a great way to relax. My fabulous friend Gill had been promising to show me how to make clay roses for some time, this was a skill she picked up when she first left school at 15 to work in the one of the Staffordshire “Pot Banks”. These were the factories that were found all over Staffordshire at the time which made all the hand finished fine bone china which was exported all over the world. Gill holds demonstration classes in Stockport and I hope that you will all agree that she has quite an amazing skill and one that she makes look so easy. So to help anyone who wants to have a go at making one of these beautiful roses Gill photographed my attempt and I have used the pictures along with a written explanation to help break down what she taught us. 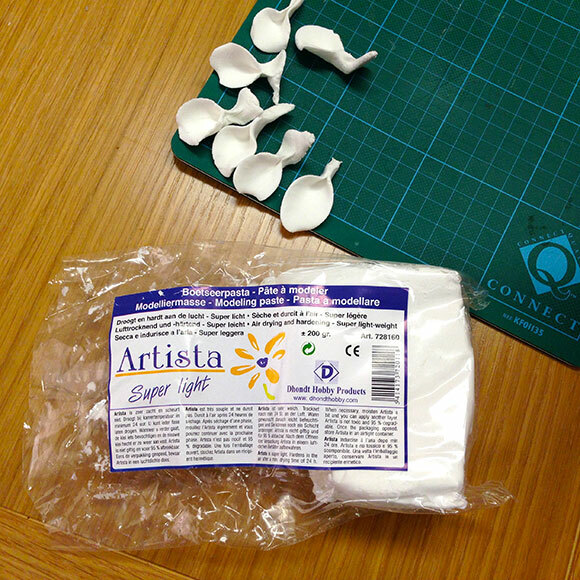 Break off a small amount of the air dry clay, I found a ball shape of about 2 to 3 cms in diameter was sufficient. 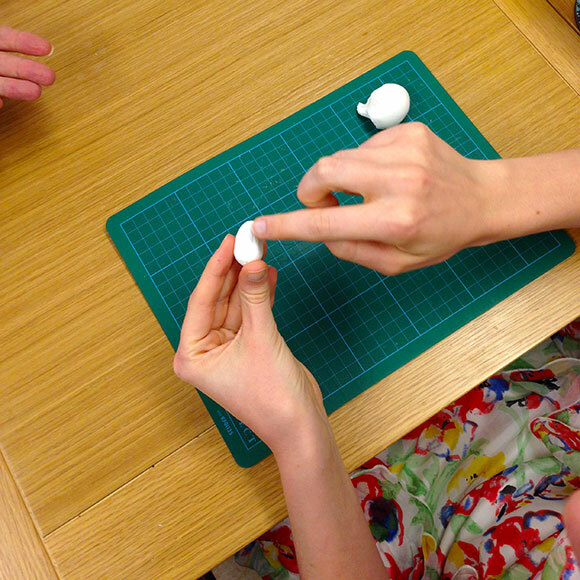 Then roll it in your hands to produce a cylinder shape ( like a sausage ). Grip one end of the cylinder between the base of your index and middle fingers. 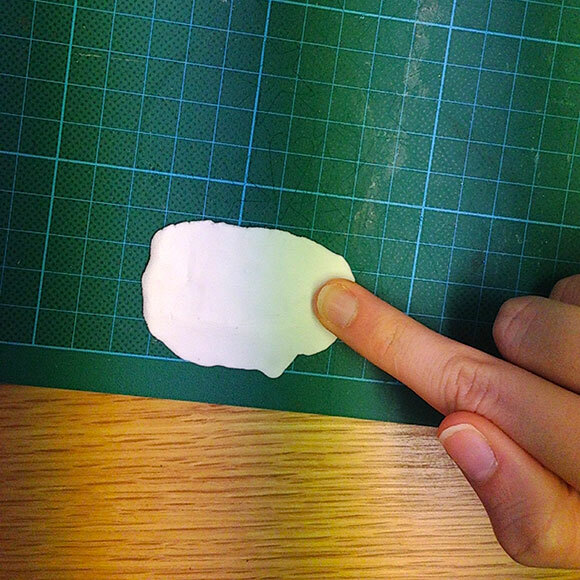 Then pressing firmly on the opposite end, flatten out the clay on the palm of your hand to make roughly an oval shape. Take the cylinder and pinch the clay at the base of the flattened oval, then bend the top of the flattened oval shape ever so slightly before breaking away the excess clay from the base of the petal. 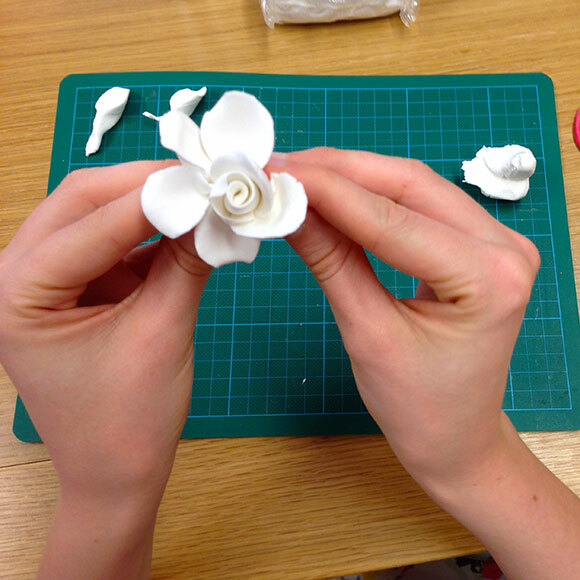 Make sure to leave enough clay on the base of the petal to use when you add it to the finished rose. Continue by repeating the above process making eight leaves in all. This is the Air Dry Clay that we used. 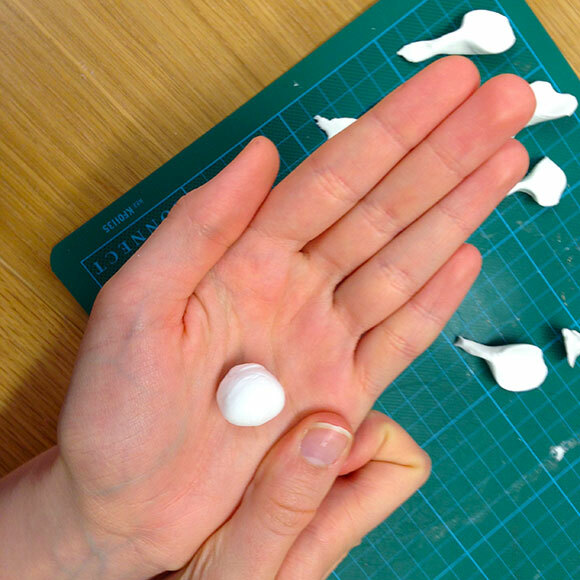 Then taking a similar amount of air dry clay as before make another ball shape about 2 to 3 cms in diameter, Then on your work surface roll out the clay to make a cylinder about the length of your thumb. 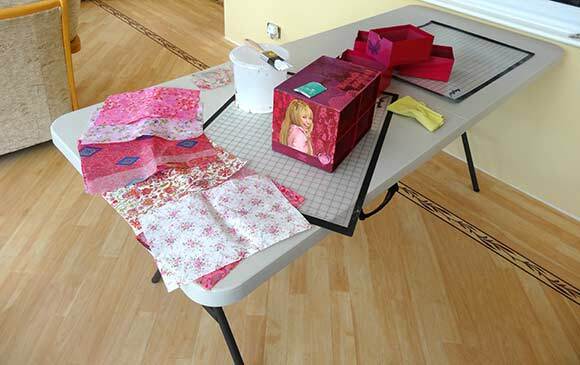 Then place it on to your work surface and flatten it out in a rough rectangle shape. Try to make one of the longer sides a little flatter than the other as this will be the top edge of the rose bud of your rose. Then starting at one end roll the clay a bit like a “Swiss Roll”. 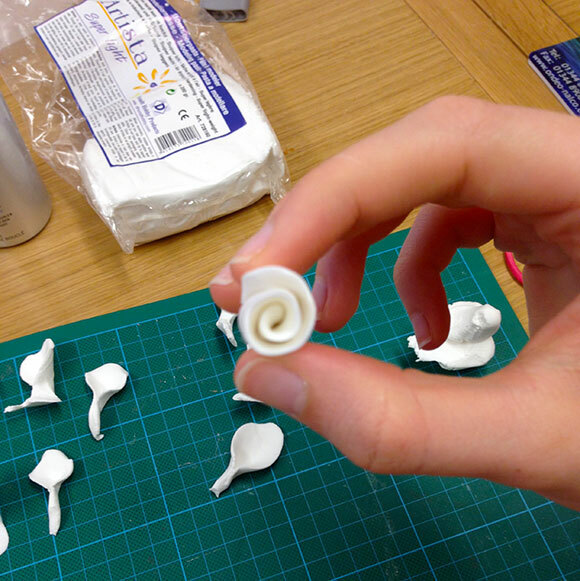 Then pinch the base of the roll leaving the thinner petal end clearly on show. 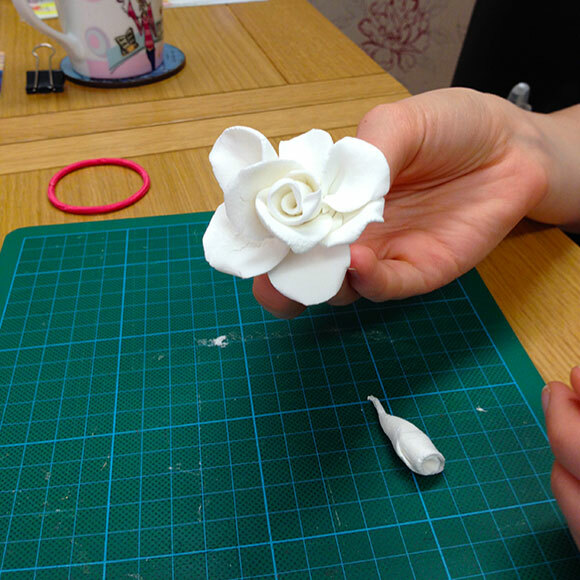 You then take one of the petals that you made earlier and using the excess clay left at the base of the petal attach it to the base of the rose bud that you have just made. 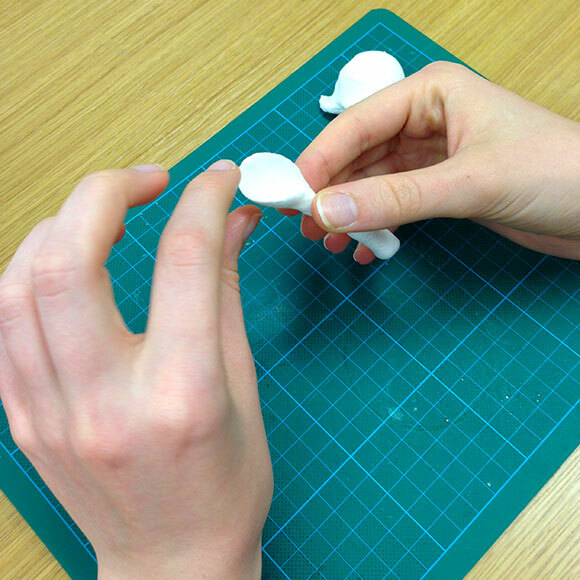 Then press along one edge of the first petal so that it attaches to the rosebud, leaving the other side loose. 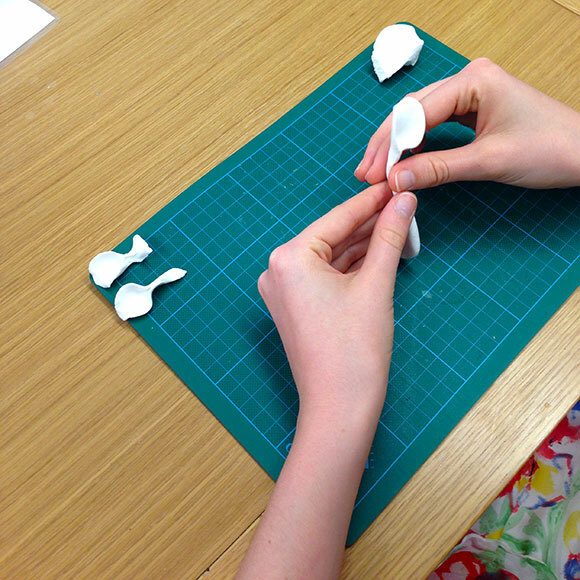 Do the same with a further two petals, spacing them equally so that the centre of your rose starts to take shape. Then with the remaining five petals that you have left add them using the excess clay at their bases to attach to your rose. Try to space them evenly around the centre to give a natural look to your rose. 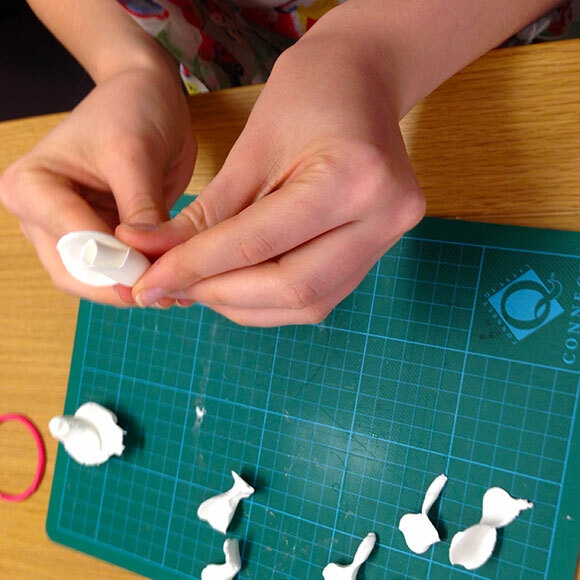 With all the petals now in place press them together firmly all around the base, you should now have the petals in a very traditional rose shape. Then to finish off hold the rose upside down and gently rotate the base by twisting lightly between your thumb and index finger. As the base starts to become thinner and longer remove any excess air clay by pinching through and breaking it off. Make sure you leave just enough air clay attached to the base of the rose to allow you use it in whatever craft project springs to mind. I’m going to use them on cards and in my box frame pictures but they look just as good painted when dried and used to embellish all sorts of things. I normally take the train, which is so much easier, but following last week’s concerts I found myself in Glasgow with my little car and it gave me a great opportunity to go home for the weekend 🙂 so on Friday the 15th of November, I drove home from Glasgow for a little “me time” with my family. It took me four and half hours, which began fabulously, my attention was focused and the excitement built as I felt like an explorer on a great adventure! Following the road as it meandered through the beautiful mountains it made me wonder about people who must have travelled this route before the motorways and trains had ploughed their way through the landscape. But after my first rest break the scenery changed and with the motorway growing more monotonous I just wanted to get home. Boredom kicked in and I had to keep pinching myself to stop me from attempting doing to silly dances to my music playlist in the car. I was then treated to a surprise late birthday meal by my Mum and Dad, which was truly delicious but to be honest the best part was spending some time with my family. I am such a family girl at heart and my parents provide me with support and help me to talk through my plans and aspirations. We chatted and discussed my coming concerts and repertoire and when we finished I felt tons better and ready to begin my term with renewed fire in my belly. On the Saturday I was taken back to my childhood with the beautiful 😉 singing of our family friend Lee. When I was tiny we often duetted to the “Back Street Boys” and “Five” including all the dance moves 🙂 I felt compelled to join in and we both had a really good laugh. Then the door bell rang and my Nana and Granddad greeted me with big grins and even bigger hugs and before I knew it the whole family was almost back together. We had a great afternoon my Nan, my Mum and me all together making Christmas and Birthday cards, it was brilliant fun. Thinking about it we left my Mum with all the clearing up to do 🙂 sorry Mum, but hey at least leaving home hasn’t changed me at all LOL ! !